Does social media have social value? Yesterday was a prime example of social media having social value. Election Day 2010 and the social networks had many offerings to create voter awareness, connect voters to the candidates who care about the issues they care about, and even offer an easy way to locate your voting location. 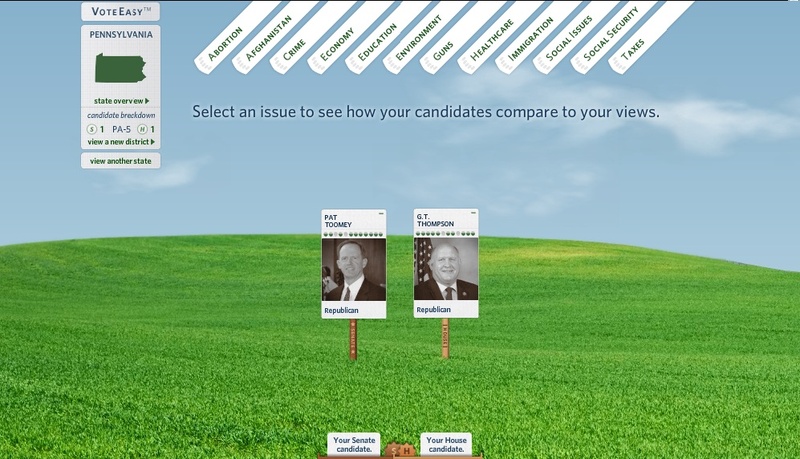 Brought to you by Project Vote Smart, this interactive map shows you all of the candidates (I missed that screenshot with 6 candidates) and, as you answer questions on issues such as abortion, afghanistan, economy, education, and healthcare to assess your interests and then maps out where candidates stand in relation to your views by moving the candidate avatars closer to the front (when align) or farther back (when they don’t). It’s easy, the user experience is clean, and it’s a relief to have something else besides dirty political ads to work with to better understand the issues. Another interactive site that asks you where you stand on issues and then matches them to a candidate. Not quite as much fun–yes, I’m 12, what’s your point?–but does get the point across. Unlike VoteEasy, it actually has an Opinion area for people to leave comments, and allows others to rate the opinion/comment. Does this really work? I didn’t see an awful lot of cogent, articulate comments, and it isn’t a site that I would visit multiple times and actually build a community, but it is reminiscent of the OpEd page of an online newspaper, so perhaps that was the effect they were going for. This was an interesting way to engage a social network where the community was already established. Foursquare used the midterm elections as a dry run to collect data and test their design for a replicable and scalable system for the 2012 Presidential election. Throughout the day, this realtime application updated when Foursquare users checked into their voting locations. On Election Day, Foursquare logged 50,416 total check-ins at 23,560 different voting venues, tracking 58% males and 42% females. And, if you needed to locate your voting location or wanted to identify the candidates and issues on the ballot in your area, there was a handy link to vote411.org and the incredible wealth of voting resources they provide. Not to be outdone, Google offered their own comprehensive election page. Enter your full home address where you are registered to vote, and you get pretty much all the other features mentioned above, as well as turn-by-turn directions to your polling place, compliments of the Google API. Additionally, Google offered an exclusive mobile site (m.google.com/elections) to track the newsfeed and returns. Most likely, Google was positioning themselves to compete with CNN’s election app for smart phones, but I like the fact that companies are looking at mobile solutions and social media to encourage civic participation and increased transparency. I applaud social networks encouraging the community to go vote, and to get involved, and to learn more about what the candidates really are all about. Because, God knows, we don’t get that from the candidates.